Applaud the parade, then eye the floats throughout the weekend. 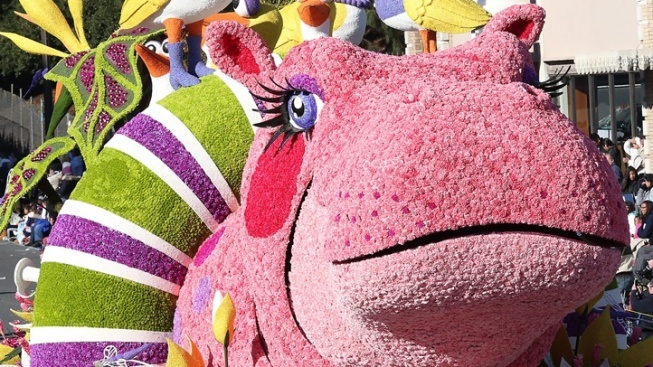 Applaud the Rose Parade on Friday, Jan. 1, then eye the magnificently detailed floats throughout the weekend. 127th Tournament of Roses: People here, near, and far'll have their eyes on Colorado Boulevard and the Rose Bowl on Friday, Jan. 1 as one of the over-the-top-iest traditions in all the land rolls and runs in Pasadena. You can admire those impressively petal'd floats from a curb or a screen on New Year's Day, but should you need to get closer, as in a bunch closer, there is the popular Post Parade Showcase of Floats. This is just what it sounds like: Rose fans get draw near the magnificent machines after the parade wraps. Sierra Madre and Washington Boulevards is the place, you'll need a ticket, and the lookie-loo-ing is on through Sunday, Jan. 3. New Year's Race Los Angeles: So how does one jumpstart those "be healthier" resolutions one is currently in the process of making? A stroll by some floats in Pasadena over New Year's Weekend is one fine path, as is joining the annual nighttime race through downtown Los Angeles. It glides among the lit-up skyscrapers and fountains on Sunday, Jan. 3, and there are a few routes/lengths to select from (a half-marathon, a 5K, a 10K, and an afternoon fun run for the young'uns). Maybe you need to work up to your fresh start, or maybe your fresh start starts ASAP, with some of downtown's after-dark beauty to add flair. Disneyland Changes: Speaking of "Star Wars," you and every droid and Wookiee around has heard that a 14-acre land themed to the Lucasian universe is headed for The Happiest Place on Earth in a few years. This means some closures at the theme park, some temporary, some permanent. Jan. 10, 2016 is the final day for Big Thunder Barbecue and some other treats around that area of Disneyland, so go Anaheim if you want to get your ride on the Mark Twain in before construction begins. Palm Springs Film Festival Opens: Don't call it the Coachella of the screen arts, though it shares a creative spirit with its springtime sibling (sibling, at least, due to location). It's one of the biggest film parties on the California calendar, and a bunch of stars red-carpet it up in the land of pools and paparazzi. Opening date? Jan. 1, which means the whole movie awards/parties/buzz season has officially begun 'round Southern California, as if it ever truly ends in our neck of the woods (er, beach/desert).